New to the area and would like detailed information about West Crooked and Middle Crooked Lakes (plus many other lakes in the area)? The "Lake Information" link below will take you to the Minnesota Department of Natural Resources web site and you can find all kinds of useful information. The image below is an example of the LakeFinder search box on the Minnesota DNR site. 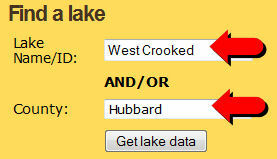 For information for West Crooked enter "West Crooked" in the "Lake Name/ID" box. We are located in Hubbard County so you can search all the lakes in Hubbard County (there are over 170) by selecting "Hubbard" in the "County" drop down box. To go to the Minnesota DNR site, simply click on the "Lake Information" link below left.